How about trying a real-time experience towards SUTURING? Get this kit right now, start practicing and be a PRO! Large 7" x 5" Size. When you stitch a wound on a bleeding patient in the state of emergency, you want to feel confident and prepared. Trust yourself to give your patients the best care they need and deserve. Doctors, Nurses, Vets, and medical students can practice on this suture pad to master the art of suturing! This suture pad is portable and easy to carry, comes with 14 wounds of different shapes and sizes, you can practice innumerable times and enhance your stitching skills on this realistic platform. Dealing with realistic open wounds would help you gain confidence in stitching and closing wounds as a qualified professional and also practice suturing before starting a real job or residency. High-quality, durable silicone composite material will not be easily separated, rip or tear, carefully designed to replicate skin elasticity. Suture Pad comes with many sophisticated wound patterns. It's great for beginners, intermediates and advanced users. You can practice with it even more, just flip it into the muscle layer and start practicing. This product has a built-in "mesh layer" between the skin and fat layer, which makes the pad more durable. This is a perfect gift to give Medical Students, nurses or Veterinarians. 1 x Suture pad with plastic base. 2 x silk suture 2/0 (3 metric) reverse cutting 30 mm needle 3/8 circle. This product is intended for demonstration purposes only and is not intended for use over humans or animals. Order now! You have nothing to lose with our 100% money back guarantee. 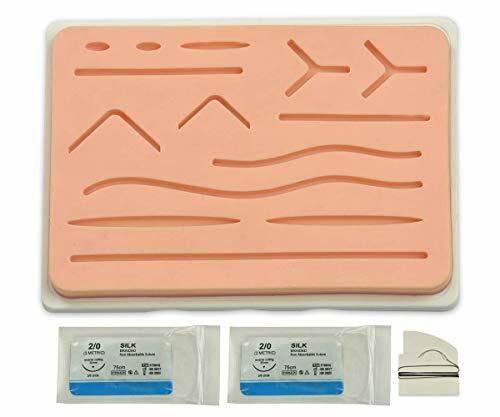 DURABLE AND HIGH QUALITY KIT TO PRACTICE SUTURING:- This high quality silicone suture practice pad comes with a variety of open wounds, extremely realistic in imitating human skin, fat and muscles. Our suture pad is considerable for medical students, nurses and veterinarians in practice, training them for real-life scenarios. Constant practice with our suture kit is guaranteed to make you confident to deal with all kinds of wounds at critical times as you can practice incisions again and again. GENUINE & REUSABLE, VARIETY OF WOUND PATTERNS ON REALISTIC SKIN:- Our suture pad features several pre-cut wounds with 14 sections of different width, depth and patterns allowing you to practice various suturing techniques. Suture Pad is slightly sticky on top to allow skin to stick easier when stitching. Carefully removed seams leave no damage on the pad, so you can apply the seam up to 100 times without noticeable marks. 3 LAYERS OF MESH & ANTI-SLIP BASE:- Our suture pad is designed near to a realistic human skin comprising of 3 layers that represents skin, fat & muscle. It has a layer of mesh which makes it not easy to break, tear or rip. Also comes with a plastic sturdy base which makes it less likely to slide on the table while you're practicing suturing. SAFE & HYGIENIC:- Our suture pad guarantees cleanliness and sanitation as top priority; it's an effective alternative to dead animal's skin. We assure you that our kit is free of harmful viruses and bacteria's. BONUS! SUTURE NEEDLE & THREAD:- Our suture pad comes with 2 needles and silk threads. The suture thread is made from silk and has a stainless steel needle (3/8 reverse cutting 30mm). It's easy to hold and a strong suture needle allows you to start practicing on the suture pad right away! If you have any questions about this product by IndusRiviera, contact us by completing and submitting the form below. If you are looking for a specif part number, please include it with your message.